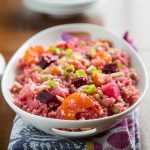 Though I love the tastes of Thanksgiving–gravies and dressings cozy with the flavors of sage and thyme–once the big day is over, I feel the need to shock my palate with seasonings and spices that would have made a pilgrim flush a bright Christmas red. So as I was thumbing through the November issue of Saveur, I was drawn to an article about North African food in Paris and to one dish in particular, Casse-Croûte Tunisien, a sandwich piled high with olives, capers, and pepperoncini peppers and drizzled with copious amounts of harissa. It looked perfect, except that the central ingredient was tuna. I realize that I could have made exactly the same sandwich without the tuna, but what would be the fun in that? 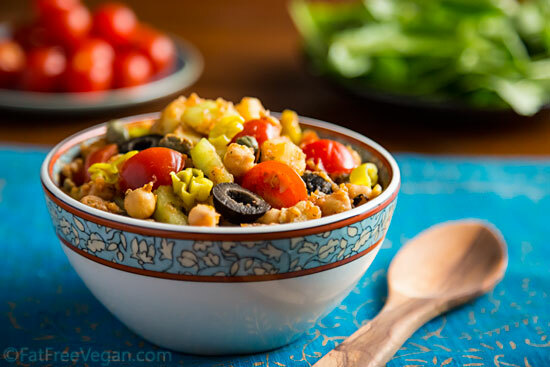 Instead, I chose to toss the ingredients together with some chickpeas to make a salad that could be eaten with or without bread. The result was a fiery salad that changes flavor with every bite. Medium-spicy harissa is the flavor that pulls it all together, and it’s the one essential ingredient. Substitutes, such as chili sauce, don’t have the same smoky flavor and may be much more spicy. You can leave out other ingredients, so if you’re not a fan of black olives or capers or just don’t have pepperoncinis handy, feel free to leave them out or substitute with something you do like. But please don’t touch the harissa. Without it, the texture would be dry and the flavor would be drab. 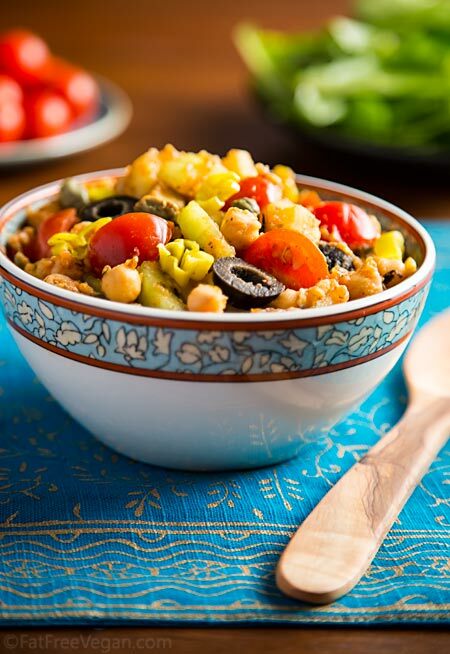 If you’re not a spice lover, this really isn’t the chickpea salad for you. 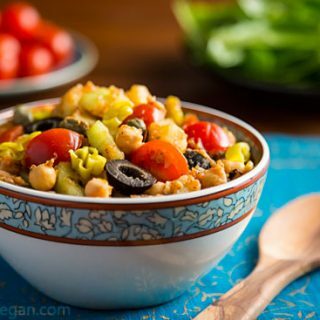 Please try my Vegan Chickpea “Tuna” Salad; everyone loves it. But if you’re a fire-lover like me, give this unique salad a try. It’s great on bread (try it stuffed in a pita) or atop your favorite salad greens. 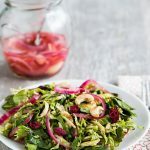 Medium-spicy harissa is the flavor that pulls this salad together, and it’s the one essential ingredient. Substitutes, such as chili sauce, don’t have the same smoky flavor and may be much more spicy. You can leave out other ingredients, so if you’re not a fan of black olives or capers or just don’t have pepperoncinis handy, feel free to leave them out or substitute with something you do like. Boil the potatoes until tender. When cool enough to handle, peel and cut into 1/2-inch cubes. Place in a large storage container and add all remaining ingredients. Stir well and refrigerate for at least an hour to allow flavors to blend. Add salt to taste and serve in pitas or other bread or with salad greens. This post contains Amazon affiliate links. When you buy something through them, you support my work on FatFree Vegan Recipes. Thanks for your purchase! I have not used harissa before – when I Google it I found it comes in paste and dried.Which do you prefer? A paste, definitely! It’s supposed to be a sauce, not a powder. Oh geez…..all I had was powder and only added two tablespoons….”almost” too spicy, but noyd!! I didn’t have any cucumber and I imagine that would give it a cooling affect! Thanks for the recipe!! I’m glad it worked out! I’m interested in trying the powder. I need to pick up some more harissa or make my own very soon! This sounds like a great lunch – I could eat it straight up. Also, do you know about how many pounds of potatoes you used? Thanks again for your flavorful recipes! Laina, the 4 small potatoes that I used weighed between 8 and 9 ounces. That recipe looks good, though I’m no expert because I’ve never made it myself. I should try! Oddly, the brand I use has beets and carrots as the first ingredients. I love pepperoncini, but the only brand available here (Mezzetta) contains yellow dye and I recently found out I’m allergic to it. Do you (or anyone out there) know of any other brands available in the midwestern US that don’t have artificial dyes, additives or preservatives? The local grocery store owner is willing to order another brand if I can suggest one in the same price range as Mezzetta peppers (around$4-$6 for 16 oz.). And I’m rural, so as far as I know, there isn’t a Whole Foods or ethnic market (other than the Amish Coop) for at least 200 miles. And I don’t like to order anything in glass jars from the internet because they come broken about half the time. Since you know I can’t stand the heat so I have to get out of the kitchen when it comes to very spicy dishes, I’ll have to pass on actually making this one. But I certainly enjoyed it vicariously through the lovely photos. It’s a very creative combination of tastes and textures. Wonderful for the fire loving adventurers!! Looks absolutely delicious! Quick question: the nutritional value as you posted here, does that include the bun? I’m guessing not but just wanted to check. Thanks! No, it includes only the salad ingredients, including the optional ones. 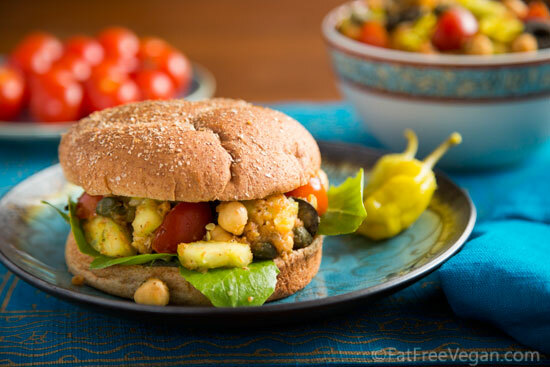 Love a good chickpea salad – looks amazing in the bun! This looks amazing!!! I can’t wait to try this over the weekend. Yum! This sounds great! Harissa is a little “exotic” — at least, we can’t buy it locally. But I make an effort to buy it when I make it to the big city, and have made it myself twice, and LOVE it! Just signing up so I can follow the comments! I enjoy reading your recipes, and have tried a few. We are trying to get to a lower-carb diet, and some of your recipes fit the bill! this is the first time i’ve heard of Harissa. Do you know where i can buy it (rather than make my own)? Try a Middle Eastern grocery store or restaurant. If they don’t have it, they may be able to tell you where to get it. I buy it at a local store, and it’s very inexpensive–about $1.50 for a 4.5 ounce can. What about substituting chopped Bok Choy for the Nori? Well, I don’t think the bok choy would add the fishy taste that nori does, but if someone likes bok choy, why not? 🙂 Thanks for recommending my recipes! I made a version of this by using the spices I found for homemade harissa online and added it to the cashew-tofu mayonaisse. It was delicious. Thank you Susan for your great recipes! I am so obsessed with capers – I just love how briny they are, and the unexpected salty punch they lend dishes. This sounds like a lovely and unique potato salad, with the added bonus of protein. One bowl meal! Sounds and looks delicious, Susan. I am drawn to anything Mediterranean, but I think Tunisian food features the best of both European and North African cuisines. Isn’t Saveur gorgeous? This looks so delicious, i cant wait to try it! At last! A recipe that combines all of my favorites! 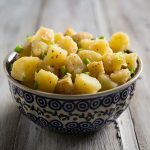 I love chickpeas in every form (hummus/falafel), I eat potatoes on a regular basis, and harissa and zatar are my go-to Middle Eastern/North African condiments. I’ve been trying to incorporate more tomatoes in my diet, a great source of lycopene. An article I recently read at http://www.schiffvitamins.com says cooked tomatoes have even higher percentages of lycopene. How that works out, I’m not quite sure. Could I roast the cherry tomatoes or even puree them? Also, can I increase the amount of cherry tomatoes without upsetting the balance of flavors? Having lived in Tunis for 3.5 years, happy to see “Tunisian” inspired food. 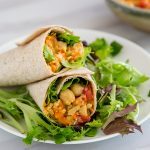 The sandwich is well known street food – but there are also excellent Tunisian salads which are simple but delicious due to the fact that all the local produce is local, organic etc. The classics are slata Tunisian (cucumbers, tomatoes, peppers, lemon – all chopped finely and fresh), slata mechouia (roasted peppers, olive oil, cumin – absolutely amazing). Their cooked carrot salad with carroway, lemon, olive oil and Harissa is also excellent (but the local carrots definately make it). A comment on Harissa – it is easy to make (although it takes some effort if made traditionally, with a mortar and pestle – never seen the cooked version referenced below from WF). Dried peppers, garlic (depending on the region), olive oil, spices. It’s origin Tunisian, the most widely available canned version is “Harissa le Phare du Cap Bon”, from Tunisia’s main pepper growing region. Typically served as an appetizer with olive oil, olives and the ever-present garnish in Tunisia, tuna. susan, susan, susan! as i perused this recipe, i came across your inclusion of HARISSA. to my utter shock you used the on-the-market tube of pre-made stuff. why? harissa is by far one of the least difficult condiments to prepare at home. a vegan for forty-seven years, i remain a fan, but….MAKE IT YOUR SELF ONCE AND YOU WILL LAUGH AT THE EASE OF PREPARATION. good day: i cannot believe you purchase harissa rather than preparing it your self. it is sooooooo easy. This looks delicious…my first thought was that the finished product would be delicious tucked into phyllo pastry and baked…then maybe dipped into something delicious…Yummy. Thanks for this recipe. I made my own Harissa a couple of week ago and needed some inspiration to use it. Oh, my this is good. I can’t wait to make it for my husband. I made it on the hot side and it is definitely warm. I always tweak recipes, so I added a few tablespoon of fresh Italian parsley. Plan to serve it over a salad with lemon tahini dressing. Thank you again. Are you using harissa paste or harissa seasoning (I’m not even sure if that’s a thing)?